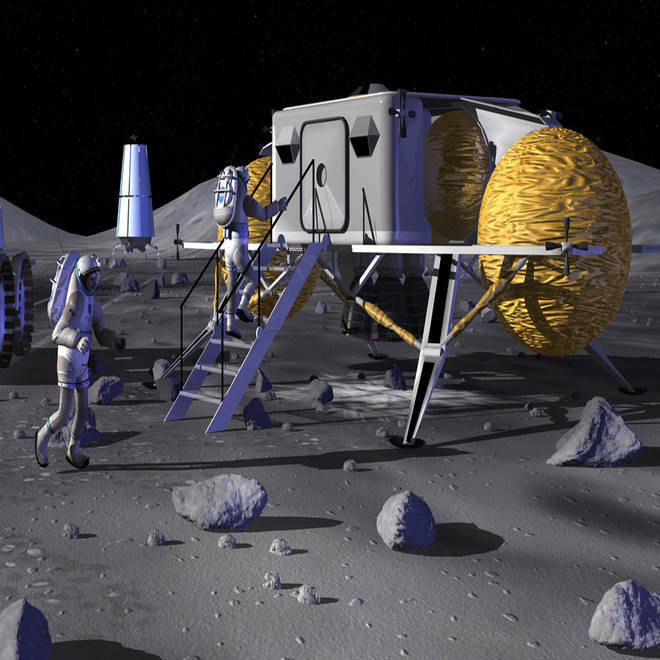 NASA contemplated setting up a lunar outpost like the one shown in this artwork back in 2007. Now House Republicans are reviving the idea of establishing a "sustained human presence" on the moon and Mars. House Republican leaders want to push for outposts on the moon and Mars — and they want to push NASA's plan to snare an asteroid into the dustbin, according to a discussion draft of their space spending plan. "It is the policy of the United States that the development of capabilities and technologies necessary for human missions to lunar orbit, the surface of the moon, the surface of Mars, and beyond shall be the goals of the administration's human space flight program," the GOP version of the NASA authorization bill states. One of the goals would be "to develop a sustained human presence on the moon and Mars," according to the draft, which is expected to come under discussion at a House Science space subcommittee hearing on Wednesday. NBC News received a copy of the draft in advance — as did several other media outlets, including Politico and Space News. The draft bill would block the Obama administration's initiative to send a robotic probe to a near-Earth asteroid in 2017, with the aim of bringing back the space rock — or a substantial piece of it — for study by astronauts in the vicinity of the moon around 2021. On Tuesday, NASA touted the plan as part of an initiative that also includes a stepped-up program to identify potentially threatening asteroids and figure out what to do about them. During a recent round of hearings, congressional Republicans were supportive of the asteroid-hunting effort, but sharply critical of the asteroid-grabbing mission. That's reflected in the draft legislation. The draft would hold NASA's spending level at $16.9 billion, in accordance with the current sequestration situation, but it leaves the way open for increased funding if a deal is struck to loosen the budgetary purse strings. It would continue to fund NASA's major development projects, including the Orion crew capsule, the heavy-lift rocket known as the Space Launch System, and the James Webb Space Telescope. It also sets aside $700 million for supporting the development of crew-capable commercial spaceships — which is less than the administration's budget request of more than $820 million. The main point of debate is likely to be the thumbs-up for outposts on the moon and Mars, and the thumbs-down for the asteroid mission that has become the Obama administration's main focus for space exploration. NASA has said such a mission would help clear the way for exploration of Mars and its moons in the mid-2030s. The idea of establishing a lunar base arguably played a role in the decline of former House Speaker Newt Gingrich's fortunes in the 2012 presidential campaign. Gingrich's plan to have a moon base in operation by 2020 drew derision from Mitt Romney, who said he'd fire any employee who suggested spending hundreds of billions of dollars on such a venture. Estimates for the cost of building a moon base have run from $40 billion to $500 billion, depending on whether the person doing the estimating wants to encourage or discourage the idea. In comparison, estimates for the total marginal cost of the asteroid redirect mission have been in the range of $1 billion to $2.6 billion. The draft authorization bill doesn't address the long-term spending projections or schedules for missions to the moon and Mars. Rather, it advocates a step-by-step, "go-as-we-can-afford-to-pay" approach. That carries the risk of giving NASA an ambitious goal without adequate funding to get there — which was the fatal flaw in President George W. Bush's plan to send astronauts to the moon. The bill is likely to join the Obama administration's budget proposal as one of the starting points for debate over the future of the space effort. Yet another starting point should come to light when Senate Democrats lay out their version of the NASA authorization bill. Which way to Mars? Moon or asteroid?